One of the iconic pieces of terrain in South East Asia and Japan in bamboo forest. These are relatively easy to model, thanks to the fact that you can order plastic model bamboo from China via eBay – a 100 piece bag working out at around £5 including postage. You can see an example listing here. As you can see, it comes as a simple plastic rod with leaves attached, so it is awkward to make stand up. I have seen several different methods used to base this, but I wanted something quick and easy, so I decided first and foremost that my terrain pieces would feature clumps of bamboo – a thicket if you will – which in game terms would not only block line of sight, but would also be impassable. This would handily circumvent the need to ensue that a miniature base would fit on the terrain. So, how would I make the bamboo shoots stand up? I thought I would turn to a material that is designed specifically for this purpose – floral foam, otherwise more commonly known as ‘oasis’. This material is designed to hold floral arrangements in place – iit is light but dense material, and the shoots of plastic bamboo can be easily pushed into it and held firmly in place. It is worth noting that you should be looking for the Dry Floral Foam. There is a ‘wet’ version, which is green and designed for use with fresh flowers. That material really isn’t suitable for our purposes. The great thing with floral foam is that it is very easy to work with. You can cut it with a household knife (use a knife with a serrated edge) and it can be carved and shaped with little effort. It has been pointed out to me that you do have to be careful with Floral Foam, as the dust produced when the material is cut or sanded is potentially quite nasty – you should avoid inhaling it. Please use a mask, and work in a ventilated area. For each terrain piece, I cut two slices of foam, roughly 15 – 20mm wide, glued them to a piece of MDF using PVA wood glue and waited for them to dry. Once dry, I carved the shape of the small hill I wanted using the household knife. I then covered the whole thing firstly with PVA glue, and then with sharp sand to provide texture. Once the sand had dried, I applied a basecoat of dark brown emulsion. I use ‘Java Bean’ from Wilkinsons as my standard dark brown for all my basing. This was followed by a drybrush highlight of Sandstone. I used to apply two or three highlights in various shades, but since the majority of the area is going to be covered in flock and static grass, a single highlight saves time whilst still looking effective. One the painting was done, each base had flock applied, leaving some of the ground detail still showing. Then, it was simply a case of taking your bamboo pieces and pushing them into the surface of the bases in a pleasing arrangement. I dipped the end of the bamboo sticks into PVA, which would hopefully provide some extra strength for the final model. As a final touch, I applied some areas of static grass to he flock, providing some different texture – I use this method when basing figures, so the terrain piece matched my figure bases. I was surprised with how much I actually used – the six pieces I built required two bags of bamboo. However, I am pleased with the result as the terrain looks suitably thick. 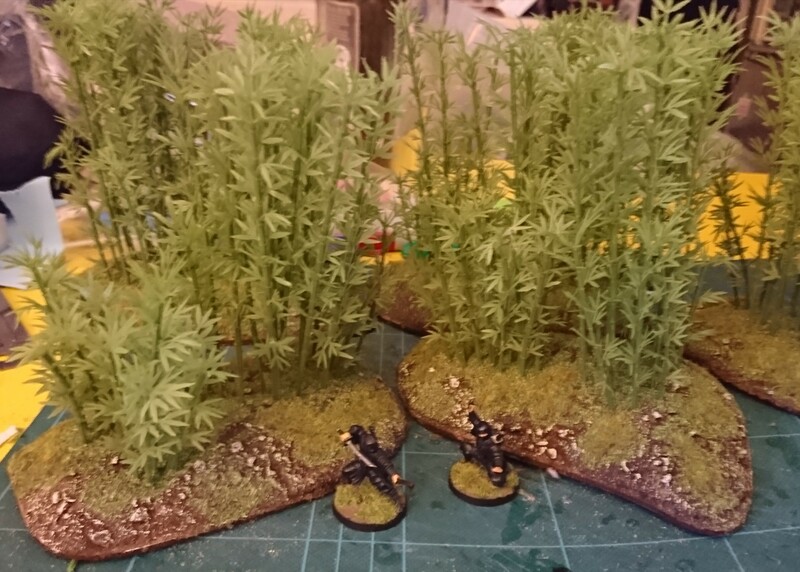 Easy and cheap bamboo forest – will cost about £15 – £20 for all the materials (including the MDF bases) and they only took a few hours to construct. very nicely done. i have made similar using the same bamboo pieces but the addition of the foam appears to be a brilliant way to go. Great looking jungle terrain. Just to let you know thst having gone to my local Wilko store today that they do not now have Jave Bean colour in their range. Would be interested to see what you think is the nearest colour to replace it from Wilko’s or elsewhere. I often use Bitter Chocolate smooth masonry paint from Homebase which is in larger tester pots. I was only looking at it today and thinking that I will need a new pot soon. Another type of bamboo grove seen in Japan has much taller bamboo spaced out and is not impenetrable. This is common in ornamental gardens such as in the vicinity of temples and noble homes. It is managed, not natural so would have stumps dotted about. Google Arashiyama to see the most famous example. Schuck your a swine…….I’ve bought bamboo, floral foam and irregular mdf on EBay, and now my fingers hovering over the buy button on a load of 15mm Vietnam figures…..Damn you!